Malaysia is a country that doesn't have birthright citizenship. I've found that our American community often assume that Cyrus automatically has the possibility of being a Malaysian citizen because he was born here, since that's the way it works in our country, but nope, for the first three weeks of his life, Cyrus was sort of a man without a country. Because we are both foreigners, the responsibility was on us as his parents to get him documented as a citizen of our home country. We researched the application procedure before his birth, and collected and prepared as many of the documents as possible even before he was born in order to make the process a bit easier once he actually arrived. 1) Proof of the parents' citizenship, i.e. passports. 2) Proof that at least one of the parents has resided in the USA before--one option is college transcripts and diploma, but there are a variety of potential ways to prove residency. 3) Proof that the parents are really the parents and that the mom was actually pregnant with this baby, in the form of receipts for hospital bills, ultrasound photos, medical records, hospital bracelets, and photos of the mom while pregnant and in the hospital with the baby (good thing I took those bump photos periodically, right? ), marriage license if the parents are married, proof that the parents are in the same location, etc. 4) Proof that there is a baby, i.e. birth certificate, the baby himself, passport photos, etc. Angel was like a paperwork tornado on our first day home after Cyrus's birth, and got his application mailed into the US Embassy first thing Monday morning. After a series of emails with them, our appointment was set for three weeks after his birth. 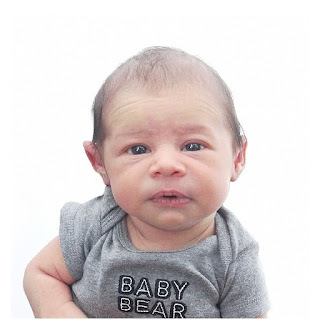 We needed to get passport photos taken of him, and we'd heard that they are quite picky about newborn passport photos, so we painstakingly made sure his eyes were wide open and his head was straight for his photo (not easy when he had the neck control of a 10-day-old baby). We live about a 5-hour drive from the U.S. Embassy, and I'll be entirely honest, the idea of a long road trip, 10 hours of driving in a day, with a tiny baby, was rather intimidating. Thankfully, Mom was able to join us for the trip--little did we know at the time exactly how much three adults would be needed! The drive down went smoothly. We were in the car by 4 a.m. and stopped once to feed Cyrus. Angel got just slightly turned around when trying to find a place to park near the embassy, and we ended up parking at a mall about 1 kilometer from the embassy. The walk from the mall to the embassy was brutal in the blazing hot tropical sun. It wasn't even 10 a.m. yet, but in this part of the world, it doesn't have to be the middle of the day for the sun to be scorching. We made it to the embassy and through security (cannot bring any phones, laptops, or even car key with an electronic tag inside), and then through the second set of bag checks. The guard laughed at us for having so many bags--I had a purse, Mom had a purse, Angel had his satchel, briefcase full of important documents, AND we had a well-stocked diaper bag for baby. I joked back that it's not like we could opt to leave the diaper bag behind! Once inside, we took our number, and when we were called up, went up to the window with baby and all of our paperwork. First they took all of our documents, then asked us to go and pay, before sitting down and waiting for the interview. We probably waited about 40 minutes before getting called back up--Cyrus behaved himself pretty well during the wait because Grandma could walk around with him, but of course as soon as we all got called in to a tiny glass room for the interview, he started crying, and the interviewer said that Grandma could take him out to walk around again. He likes to take thorough tours of every location he visits. Angel and I had to take an oath that everything we'd reported on his application was true, and then answer a variety of questions. One that slightly stumped us was "When was the first time you left the USA, where did you go, and for how long?" I guess answers like, "Ummm, I was probably about 4 or 5, and my parents took me to Mexico, and I was probably there for a week or two?" and "I used to live in Michigan, so my family went to Canada a bunch of times when I was young." sound legit enough. Angel also got asked what his middle name was, they asked if I went to college in the USA, why we were living in Malaysia, how long we've lived here, where we both were in May last year, if we'd ever lived abroad before, etc. We were told that everything was in order for his application, and it could begin to be processed right away...IF we got a new passport photo taken and turned in today. Because they couldn't accept the photo we'd turned in, as it wasn't "sharp" enough. No....this was what I was nervous about! But I'd thought his passport photo looked just like a passport photo, so we were not prepared for it to be rejected. They handed us a map of the area with places that offered passport photo services marked. The closest one was supposed to be 1 km away, and we were told we could walk it. So, we walked it. Only...we could not find the place that was listed on the map. And I'm good with maps. We even asked some construction workers for help, and they couldn't get us there, either. This is where the day got rough. We crossed multiple roads. The sun was getting even more fierce, Mom and Angel were trading off carrying Cyrus with a blanket over his face. I was sure I was getting sunburned since I'm the only fair-skinned one of the three of us and I hadn't slathered on sunscreen that day, assuming incorrectly that a visit to the embassy would not involve excessive sun exposure. I was growing more and more exhausted and lightheaded as we searched for the place to take passport photos. I hadn't packed any snacks or drinks for myself for the embassy, not wanting to carry anything extra beyond what we already had to carry, and the sun and the long walk after about 9 months of little-to-no exercise felt like it was going to kill me. I'd had it in mind that we ought to just grab a taxi and head to KLCC (aka the mall at the base of the famous Petronas Towers). KLCC was on the list of places that had passport photo shops, but because it was about 2 km away, we hadn't wanted to try for there at first. When we finally did reach a taxi stand, we were within sight of KLCC and probably half a kilometer away, but we asked the taxi driver if he'd take us. He looked at us in shock, pointed it out and said, "But it's so close!" We must have looked very desperate and bedraggled. We pointed out the extremely sweaty newborn baby, and I know I was looking in very bad shape, as near to fainting as I was, and he took pity on us and drove us to the mall. I know taxi drivers don't like to take such short fares because it's not worth it (the meter rang up at less than $1 USD), but I was at the point where I don't think I could have made it to the mall otherwise (remember that whole giving birth three weeks ago and having a rather rough recovery thing? Yeah. I wasn't doing well.). We got to the mall, Angel went straight to information and found out where we needed to go for passport photos, we got there. I was feeling distinctly dizzy, so I stumbled to the closest place where I could buy a drink, which happened to be a ridiculously expensive cold-pressed juice shop, but I didn't even care, I grabbed a bottle and started sipping it--at any cost I didn't want to end up on the floor of the mall (I have fainted before and that history--plus the weakness I've dealt with post-birth, plus the fact that I hadn't had access to food or drink for several hours, plus the long hike in the hot sun...were not a good combo). Cyrus, who had slept the entire walk, decided that the last thing in the world he wanted to do was to take a passport photo, and began screaming. I held out hope that KLCC, one of the nicest malls in Malaysia, might actually have a baby care room of some kind, so we took him toward the nearest bathrooms, where, lo and behold, there actually was a baby changing room that had chairs for nursing moms! Amazing! I fed him, hoped that would make him happy enough for a passport photo, and then remained curled in the chair, sipping my juice, while Angel brought him back to the picture place. This failed, because Cyrus was not happy enough after only one feeding (I told you this baby's nickname is "Milk Monster" because his enthusiasm for milk rivals the Cookie Monster's enthusiasm for cookies, right?). Angel brought him back, I fed him again. Angel went and bought peanut M&Ms in hope of temporarily reviving me while I was feeding Cyrus. This time, when baby was done, Angel brought him back to the photo place once more, I stayed curled in the chair, and we were successful! He got a photo with his eyes open! Now Angel was off and heading back to the embassy as fast as he could to get those photos turned in. Mom and I were starving--juice and M&Ms can only do so much, and had this idea that we deserved a nice sit-down lunch after such an ordeal as we'd just been through. We tried to go to Chili's, but they had a long, long line of people waiting for tables. So did every other sit-down restaurant in the mall. Then we tried the food court, but it was so crowded that my first thought was, "This is the sort of crowd that could cause a panic attack." And I don't even normally mind crowds all that much. I've lived in China, for pity's sake. Did I mention that KLCC is one of the most popular malls in KL? We eventually realized, a bit too late, that there would be no nice restaurant lunch for us, and opted instead to head to the basement again, buy an Auntie Anne's pretzel each, and hide out in the nursing moms' room to escape the crowds. 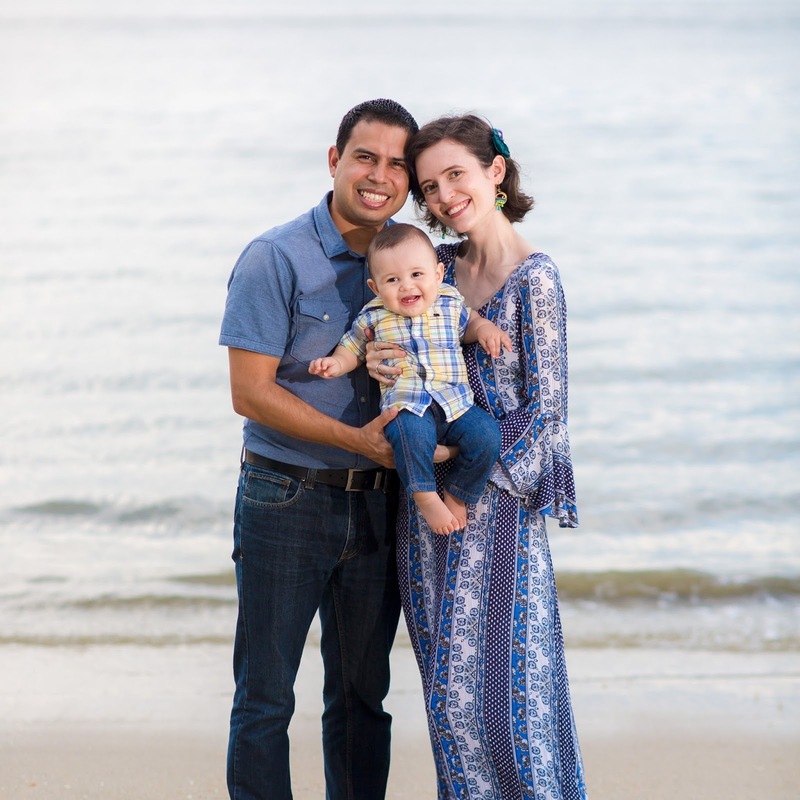 We hid out in the nursing mothers' room and ate our pretzels and drank our lemonade and I fed the baby until I got word from Angel that they'd accepted the new photo, and he was headed our way to pick us up from the mall in our car. I don't think we'd ever felt more relieved than when we got back inside our little orange car and were finally on our way home. On the way home...we stopped about 40 minutes in so I could feed Cyrus again (Milk Monster), and then he slept for a good long time. We got stuck in quite the traffic jam just 10 kilometers from the bridge that reaches our island, and by the time we reached our island, Cyrus was demanding his next meal. It was good to see home at about 8 p.m. after leaving at 4 a.m. It was quite the 16 hour trip! So, that's the story of baby's first road trip. Let's hope that the next one involves somewhat less paperwork. And less passport photography. Honestly, baby did pretty good--it was really only the photo thing that made the experience into such an ordeal. Next time, I'm coming prepared with multiple passport photos in case of rejection. And snacks for myself, to prevent bursting into tears at Auntie Anne's. Also, the day of our embassy appointment was the 8th anniversary of the day Angel and I became official. Happy 8 years to us! Oh my word!!! The thought of doing that 3 weeks postpartum nearly makes me cry. I was still barely functioning at that point as well, so I can’t even imagine. You’re a hero. Also—I cannot get over how adorable that picture is! What an ordeal! Kudos to everyone for managing to stick it out. Oh Rachel, I'm so sorry it was such a headache. Thank you God that grandma could go with you. You are strong. Oh my! That kind of day is the last thing a postpartum mom should have to do. You're such a trooper! I'm glad y'all got everything taken care of, and thanks for sharing your story! Glad you were able to get a new photo and get it all done the same day! Sounds like a mini-nightmare. I legitimately almost teared up while reading this at the sheer horror you guys went through! That sounds so awful. I'm glad you were able to get everything taken care of officially-hopefully you won't have to go through that kind of process for a long time! Sounds like you got it all sorted out in the end. Just getting my 2 kids' passport photos and actual passports was painful enough - I can't imagine citizenship! This sounds ridiculously stressful! Thank goodness your mom was along - and I def get those crazy dizzy moments when I'm nursing....I carry snacks everywhere!! Oh my goodness, girl, you are a superhero. All of that at only 3 weeks postpartum!? Dang. Oh man what a trip! I'm glad you made it and got all the paperwork done!